The objective of this Internal Assessment is to investigate the geometric numbers which lead to special numbers. The simplest example of these is square numbers, but over the course of this investigation, both triangular numbers and stellar numbers will be looked at in greater depth. The investigation is conducted for the International Baccalaureate Mathematics Standard Level class and has the purpose of looking at this mathematical concept at a much higher level. 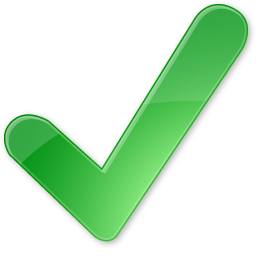 The assessment can be broken down into two major sections. 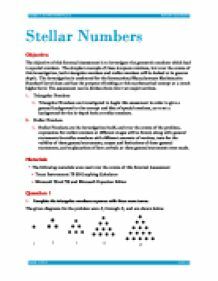 Triangular Numbers are investigated to begin this assessment in order to give a general background to the concept and idea of special numbers, as to set a background for the in-depth look at stellar numbers. Stellar Numbers are the investigation itself, and over the course of the problem, expressions for stellar numbers at different stages will be found, along with general statements for stellar numbers with different amounts of vertices, tests for the validity of these general statements, scopes and limitations of these general statements, and explanations of how arrivals at these general statements were made. Complete the triangular numbers sequence with three more terms. Consider stellar (star) shapes with p verticies, leading to p-stellar numbers. The first four representations for a star with six verticies are shown in the four stages S1-S4 below. The 6-stellar number at each stage is the total number of dots in the diagram. The diagrams that were given with the problem are displayed below. The actual task of Question 3 is to find the number of dots (i.e. the stellar number) in each stage up to S6 and to organize the data so that any patterns can be recognized and described. After looking at the diagrams above the following information can be easily determined. From this information, the pattern that I determined in that each term is 12n more than the previous term, in which n is equal to the term number of the previous term. An example of this and the information determined from this can be seen below. Ex. S2=S1+12n where n=1 because S1 is the previous term. Ex. S3=S2+12n where n=2 because S2 is the previous term. The expression which I used for the 6-stellar number at stage S7 is carried down from the . To test the validity of this general statement, I plugged in the number 4 into all three of the pre-determined general statements for 5, 6, and 7-stellar numbers to make sure that they lined up correctly with the stellar numbers that had previously been determined. The scope of the general statement is that it applies to only stellar numbers, and not to any other polygonal shape. The main limitation of the general statement is that it applies only to whole integers and real numbers. I derived the general statement from the information I got from deciphering the individual statements for 5, 6, and 7-stellar numbers, finding the patterns in these, and going from there. The numerical coefficients are equal in each equation to the corresponding number of p that is representative of the stellar number. They appear in the leaf arrangement in plants, in the pattern of a flower, the bracts of a pinecone, or the scales of a pineapple. The Fibonacci numbers are called the Natures Numbering system. It�s still a mystery why they appear in nature. Even though it increases and decreases, there is still going to be buildup of drugs. I am assuming that if this person or patient takes too much of this drug, he/ she might get into an overdose situation with all the excess amount of drug. The negative y axis of -90, 270 degree the value of sin ? =-1, cos ?=0 and tan=undefined. To prove my angles, each sign in each quadrants, I would put any random values for theta for each right values of quadrants due to their ranges in counter clockwise and clockwise. 7 + S5 = 211 * To produce the general statement, in terms of p and n, that generates the sequence of p-stellar numbers for any value of p and stage S . S = 2(n-1) p + S * To test the validity of the general statement.